Ok, before I get into today's food reviews, I do realize that the last time I updated this blog was more than 3 months ago, I suppose you all can say I 'abandoned' this blog for a long period of time YET AGAIN It seems I've been doing that alot since November last year, I'm really sorry, I might as well just come out and say that I've lost interest in reviewing food...I admit that I'll be lying if I said that it wasn't at least partially true. I HAVE lost a bit of interest in reviewing and critiquing food and snacks, but not because I don't like it anymore, it's because my life has become increasingly busy that I've gradually lost more and more time to review & critique foods. However since I haven't completely lost interest, I will still try to keep this blog alive...somewhat, but please keep in mind that I just won't be able to update it frequently. As you can read from the title of this post, today I won't be reviewing any Japanese snacks, I do apologize if any of you were expecting me to post another review for a Japanese snack, I promise I'll do that next time, but today I will be reviewing some cheap sweets & pastries I bought at my local Chinese bakery Nice Bakery a few days ago. So I'll start with the cake itself first, and I have to admit that I was pleasantly surprised by the quality of this vanilla cake mainly because cakes from Nice Bakery are often made in rather inferior quality, sometimes even more inferior to cakes you could buy at the supermarkets, that's why they're so cheap. 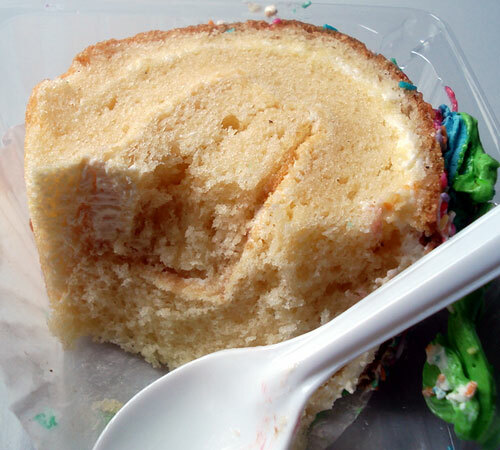 I have tried almost every cheap cake from that bakery and frankly about 70% of the time, I was rather disappointed with the quality; they were either too dry in texture or lacked any significant flavour, so my initial expectations for this vanilla cake was quite low. But I was pleasantly surprised by its texture, it was soft and moist with a very even consistency, this vanilla cake is one of the few exceptional cakes that I actually really like from Nice bakery, and I'm pleased about that As you can see from the photos the cake itself was a portion of a swiss roll, so there was a swirl of vanilla cream through the cake, the texture of the cream was soft with a smooth consistency, it also had a nice subtle vanilla flavour. The outside of the cake was coated with sprinkles which added alot of color to the cake, it also added some texture and helped to enhance the overall sweetness of the cake considerably. However to be honest, I thought those sprinkles were unnecessary, although they really helped to bring some color and outside appeal for the cake, they also added too much sugary sweetness to the cake and it started to dominate over the subtle vanilla flavour, so they were a good addition for the visual appeal of the cake, but not for the taste, and I care about the taste more than the appearance, I would've preferred it without the sprinkles. I think it would've been better if the cake was covered with more vanilla cream or vanilla icing (or frosting if you live in America) instead. The cake was also decorated with a pretty icing flower design on top, which I thought was a neat touch, the icing was smooth too and melted in my mouth, it had a slightly softer and melty consistency as ice cream, which was another pleasant surprise. The icing had the exact same flavour, so obviously they weren't made of different ingredients, just different food colourings, but I wasn't too bothered by that. 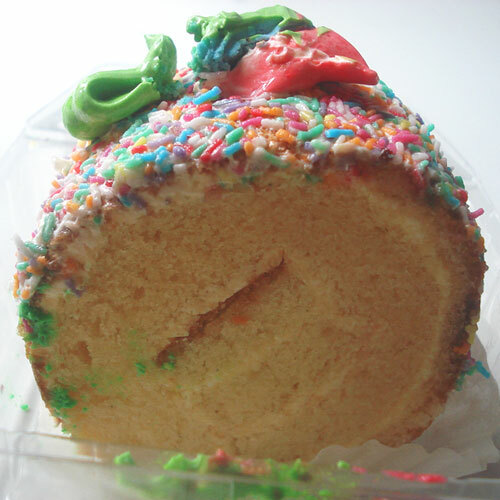 Overall I loved this vanilla cake, great texture and consistency with a nice subtle but sweet vanilla flavour and pretty appeal, but the sprinkles were unnecessary, overall it was a good cake, would I buy this cake again? Yes! 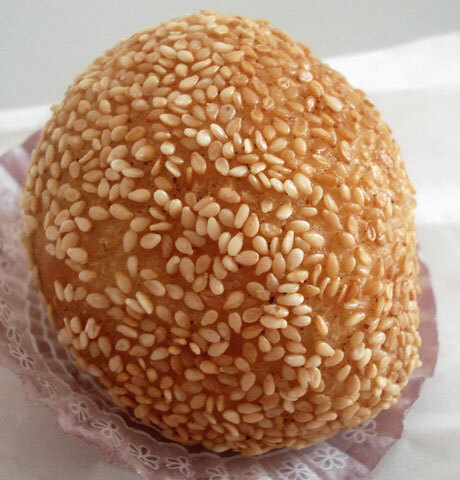 Sesame balls or Jin deui as they are known by their Chinese name, is a very popular Chinese pastry made of glutinous rice flour, coated with sesame seeds and then deep-fried, they are widely available in Chinese bakeries and at Cantonese Yum Chas. 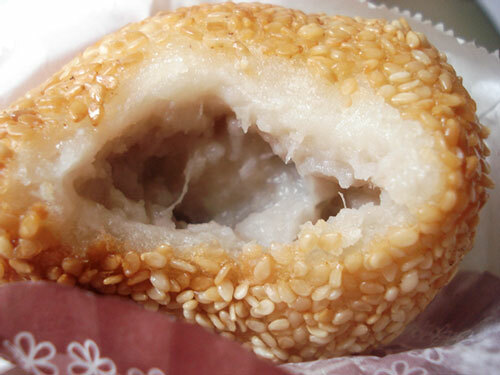 Sesame balls can have all kinds of fillings in them or sometimes they're plain with no fillings, this particular Taro sesame ball I bought from Nice Bakery was filled with taro paste inside. The size of this taro sesame ball was decent, the deep-fried glutinous rice flour dough shell was thick hard and chewy in texture, just like it was suppose to be, and the white sesame seeds added some nice texture and crunch. The taro filling itself was not bad either, there was quite a substantial amount of the taro paste inside, which was good, although the taste was subtle, but that is understandable since taro naturally has a very subtle flavour. Overall this taro sesame ball was good too, lovely texture and crunch, I would definitely buy it again. now this chocolate croissant was the bad apple of the bunch, I suppose being put in a display container for half a day can "dehydrate" the pastry because by the time I took my first bite into it, both the texture and taste were rather stale, not very fresh, and I had only bought it at the bakery about 20 minutes prior, which is why I assume that this particular croissant I bought was not part of a fresh batch Fresh croissants have a light and fluffy and flaky texture, but the texture of this chocolate croissant was flat, hard and chewy, not good. And there was so little of the chocolate filling inside, there was barely any, and the texture of the chocolate filling was hard and chewy too, not soft and smooth like it should be. The chocolate filling had solidified unfortunately, which further compounds my assumption that this particular coissant I bought was part of an older batch that had been left out in the container for probably half a day or something. Overall I'm not happy with this chocolate croissant, the textures and flavours were stale and rather unappetizing, and there was not enough of the chocolate filling inside. Maybe the main problem with it was that by the time I bought it it was not freshly made, perhaps if I had bought a fresher batch it would've been very different, I would only know for sure if I try a freshly made one. 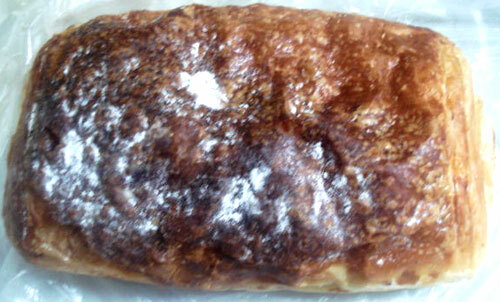 But right now, I can only critique this stale coissant I actually bought, and I did not like it. And to make things worse, this coissant costed me $1.80, it cost even more than the Vanilla cake and Taro sesame ball, which were both much superior in quality in comparison. 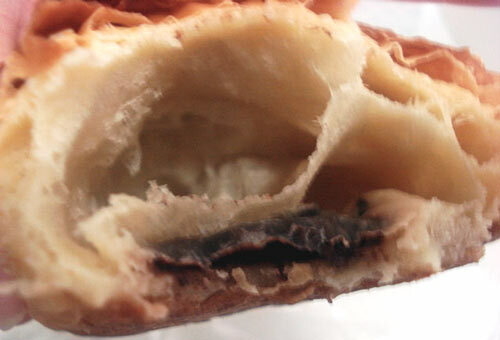 I would not buy this chocolate coissant again...unless I try a freshly made one next time.